Published by RAK, Czech Republic. 72 pages all in colour. 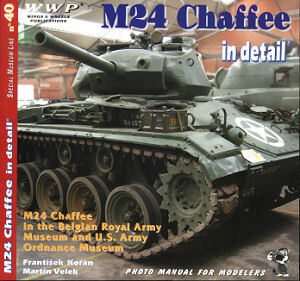 This latest title from Wings & Wheels Publications is another detailed vehicle coverage this time dealing with the M24 Chaffee Light Tank of WWII and beyond. The book has 72 pages entirely in colour except for a few line drawings from the service manual to further illustrate the close-up photos with two vehicles featured, one from the a Belgium Museum and the other from the Aberdeen Collection in the US but as with many restored vehicles there are a few additional parts added such as M41 Walker Bulldog wheels fitted to the APG vehicle and both have post war features like the bolted plates on the final drive housings. one vehicle is fitted with the wartime T72 all steel track and the other the post war T85E1 rubber chevron track to give details of both. Text is entirely in English with a brief introduction over six pages along with all round views of the vehicle for overall perspective as well as listing the technical data before moving on the detailed walk around photos. Pages 8 to 13 are on the wheels and suspension with excellent close-up shots of the road wheels, idlers and drive sprockets that show the cut-outs around the rims very well as well as shots of the suspension with a number taken from under the vehicle to show details not often seen. Pages 14 to 19 covers the front hull with individual close-up shots of most details including the head lights and guards from various angles, hull MG mounting and crew hatches again from various angles for excellent coverage with the nest four pages on the rear hull with excellent shots of the tail lights and protective covers as well as the two shackles and central two pintle. Pages 24 to 35 deals with the turret exterior with more superb close-up shots of every detail possible with numerous shots of the gun mantlet and gun, the top crew hatches with again photos from various angles to give good overall coverage of the details. There are close-ups of the searchlight with six photos, the machine gun mounting without the gun with no less than 9 photos from all around angles. Pages 36 to 48 covers the Engine compartment with shots of the engine compartment covers both on and off the vehicle as well as four shots from various angles of the fuel tank vents on the rear corners of the engine deck. 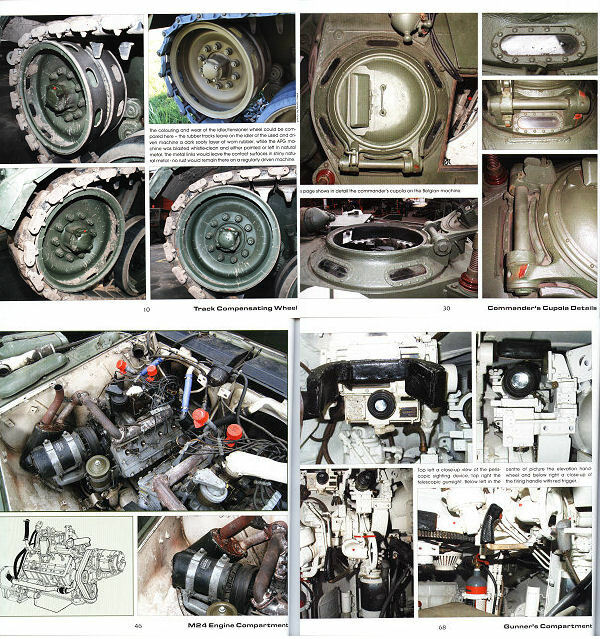 There are 10 pages of shots of the engine with the covers removed to show the many engine and accessory details with six pages having just one photo each to really show the detail with some line drawings from the service manual added to highlight the photo detail. The final 24 pages are all interior shots showing the Drover's compartment and turret interior with many superb close-up shots showing just about every detail possible including the crew positions, sights and gun details as well as the many wall fittings for an excellent interior coverage. This is a superb photo reference of the M24 Chaffee with the excellent close up shots covering just about every detail inside and out with the captions clearly telling you what you are looking at and will be an invaluable reference for Allied modellers. Thanks to František of Wings & Wheels Publications for the review book.